How about something really personal for your Mum this Mother’s Day, something to make her smile every time she stops for a good old cuppa, and if that is anyhing thing like my Mum, quite a few times a day so that’s a lot of smiles! A fabulous Mum’s Cup of Tea Teaspoon of course! 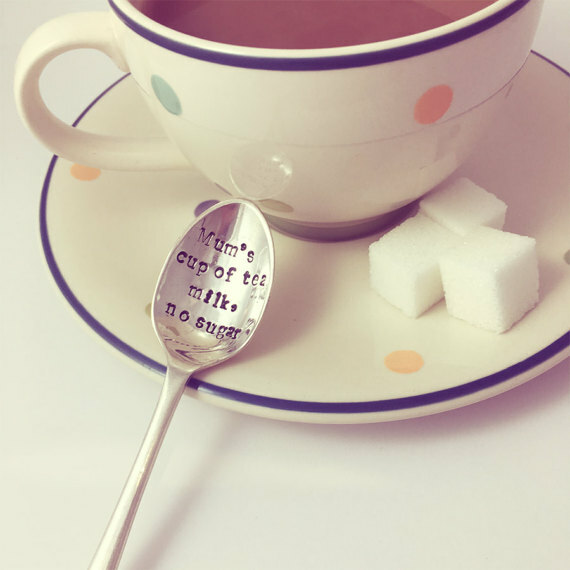 With this adorable Mum’s Cup Of Tea Teaspoon you can personalise the teaspoon with how your mum likes her tea by handstamping it on the teaspoon, genius! A vintage silver plated spoon featuring how mum likes her tea to be served, a definate must for all tea lovers we think. Don’t forget though that these are made to order with real vintage silver plated spoons so they are all slightly different in their own way, but the lovely people at Not Your Ordinary Gift will do their utmost to try to match it as closely as possible. We think these fabulous Mum’s Cup of Tea Teaspoons will cause quite a stir, and at just £10 they are the perfect gift for your Mum this Mother’s day.